For an increasing number of North Americans, the name Taizé evokes a certain style of singing that has become popular in more and more churches, retreat centers, campus parishes, and even seminaries. Some people also know that the word has something to do with retreats or gatherings focused on young adults. 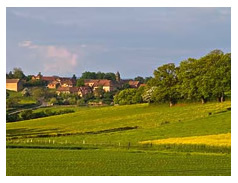 Others may even be aware that Taizé is in fact an ecumenical community of brothers located in the small village of that name in the Burgundy region of eastern France. 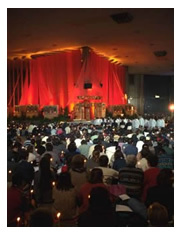 Today, the Taizé Community is composed of around a hundred brothers. They come from different Christian traditions and from over twenty-five different countries, and make a life commitment to live together in joy, simplicity, and mercy as a "parable of community," a sign of the Gospel's call to reconciliation at the heart of the world. Around the brothers, tens of thousands of people, mainly between the ages of 17 and 30, come throughout each year to spend a week going to the roots of the Christian faith. They join in the community's worship three times a day, listen to Bible introductions on the sources of the faith, spend time reflecting in silence, and meet in small sharing-groups. Spending a week listening to people one's own age from countries as diverse as Lithuania, Canada, the Philippines, and Portugal, all of whom are sharing deeply about their searching and their struggle to live out their faith, can be a life-transforming experience for those who take part. And the community encourages participants, when they return home, to take back what they have discovered and put it into practice in the concrete conditions of their life-in their parishes, their place of work or study, their families. There has never been any question of creating a "Taizé movement"; such an undertaking would simply add to the divisions that veil the face of Christ, who calls us all to live as one body. 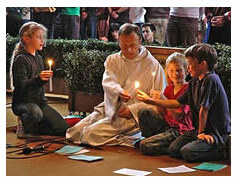 Taizé began with one man, Brother Roger. In 1940 he came to what was then a semi-abandoned village in Burgundy, his mother's native region. He was twenty-five years old, and he had come there to offer a welcome to Jews fleeing the Nazi persecution and to work out a call to follow Christ in community, a community that would attempt to live out the Gospel call to reconciliation day by day. A few years later he was joined by his first brothers, and in 1949, seven young men committed themselves for life to celibacy and to material and spiritual sharing. Taizé thus took its place as part of the great monastic family. Life at Taizé, following the monastic tradition, has always turned around three main poles-prayer, work, and hospitality. The three times of worship create the basic rhythm of the day. It is a very meditative form of prayer, in which singing and silence have always played a large part. The community also has always supported itself by its own labor, refusing any donations for its own life, even a family inheritance. If this leads to a certain simplicity of lifestyle, it is seen as yet another way to let the Gospel shine through, to focus on the essential. In addition, for a long time now some of the brothers have gone to live in situations of poverty and division throughout the world, as a concrete sign of solidarity. Taizé has always been a place of welcome, too, especially for victims of war and injustice. During World War II that meant Jewish refugees, and after the war, French orphans and German prisoners-of-war. In later years, the community has offered a haven to Spanish, Portuguese, Vietnamese, Rwandan, and Bosnian families uprooted from their lands. But for the past thirty years, a more short-term welcome has been extended to young adults from practically every country in the world and a great many different church backgrounds-or none at all. Adults come too, and families with little children: all are welcome. Since the fall of the Berlin Wall in 1989, Central and Eastern Europeans have made up a significant percentage of those present in Taizé each week. 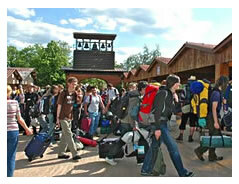 What attracts so many young people to Taizé? This question keeps on recurring, and the brothers have no answer. Those who come are very different among themselves, but all are searching. Many are active in churches at home; others find it difficult to find a church where they feel welcomed and listened to. For the community, the question Why do they come? is less important than What can we offer them? How can we help them to find ways of continuing their journey of faith, of being creators of reconciliation in the places where they live? It was this question of continuity that led the community to launch, together with the young, a "pilgrimage of trust on earth" involving meetings and visits on every continent. In the context of this "pilgrimage," large gatherings regularly bring together many in the churches of Europe, North American, and other continents. A large North American gathering for young adults was held in 1992 in Dayton, Ohio, and brothers continue to travel throughout North America for smaller meetings. This is the context in which the "songs of Taizé" have been developed. When the number of visitors to Taizé began to increase, and more and more young people started arriving, the brothers felt the need to find a way for everyone to join in the prayer and not simply be observers. At the same time, they felt it was essential to maintain the meditative quality of the prayer, to let it be an authentic encounter with the mystery of God revealed in Jesus Christ. Finally, it was found that chants made up of a few words repeated over and over again made possible a prayer that was both meditative and yet accessible to all. But it is important to emphasize that for the community, the music has never been an end in itself. It is a means to facilitate the worship of God. That is why the brothers, although they respect and strive for technical competence, place the accent not on performance but on participation. They were happy to develop a form of sung music that can be used just as well by a small group of students who meet weekly in a dorm to pray as in a celebration that fills the cathedral of a large city. The "songs of Taizé" thus make it possible for hundreds of thousands of people throughout the world to be linked in common praise of God.